GENEVA, 5 October 2010––UNAIDS welcomes commitments made by donors at the Global Fund to fight AIDS, Tuberculosis, and Malaria’s replenishment conference in New York, which was chaired this year by United Nations Secretary-General Ban Ki-moon. The United States of America led the donations—pledging the largest ever financial commitment to the Global Fund, US$ 4 billion over three years––a 38% increase over the preceding three year period. More than 40 countries, including countries with emerging economies, private foundations and corporations committed more than US$ 11.7 billion for the next three years to fund health programmes for the three diseases. Despite the record pledges to the Global Fund there is still an overall funding shortfall for the AIDS response. For the first time in 15 years, overall AIDS funding has flat lined. This raises serious concerns on future progress as a slowing in investments will negatively impact the AIDS response. It is estimated that nearly 2.8 million people are accessing treatment through financing provided by the Global Fund, more than half of the people on treatment today. However there are nearly 10 million people living with HIV who urgently need treatment. Five people are newly infected with HIV for every two people who start treatment. Large scale investments in the AIDS response have produced encouraging results. At the MDG summit in New York two weeks ago, UNAIDS revealed new data showing that HIV infections have declined by more than 25% in 22 countries most affected by AIDS in sub-Saharan Africa; and with nearly 5.2 million people on antiretroviral therapy, AIDS related deaths have fallen. 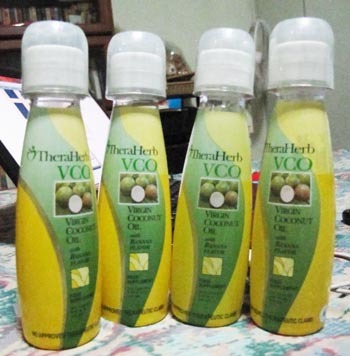 Dr. Conrato Dayrit conducted a study in the late 90’s on the medicinal value of Virgin Coconut Oil to AIDS/HIV patients. Somewhat recognized by the international scientific community, taking one tablespoon or 15ml of VCO for three times a day on a daily basis reduced the test subjects’ viral loads and CD4 counts significantly given its antiviral, antibacterial, antimicrobial, and antiprotozoal properties. You may check this website for further details or download Dr. Dayrit’s actual case study here. After doing further research and countless consultations my medical practitioner peers, it seems that this alternative supplement looks promising. I bought 5 bottles of banana-flavored VCO from the supermaket last week and I have been taking it for three consecutive days now. I’m planning to take this regimen for the upcoming five months until I get my next routine CD4 count. I’m praying and hoping that this will help me maintain my current baseline count and better if it’ll boost up my current immunity level. H4 Pavillion and SACCL, where the hell art thou? 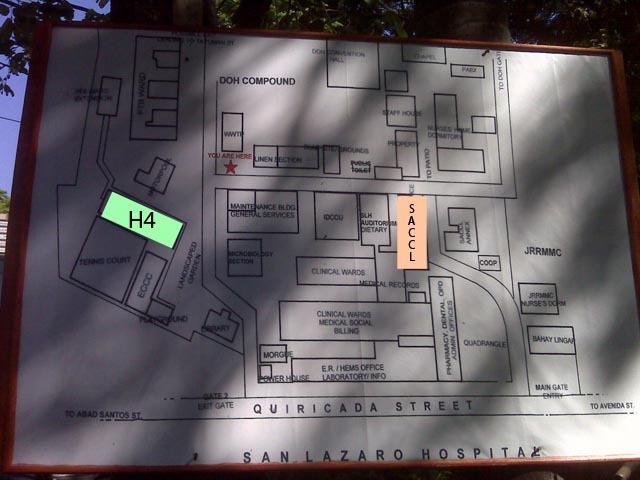 Here’s a map on where the H4 pavillion and SACCL are at the San Lazaro compound which I took when I got my CD4 count. I got lost the very first time I went there and I don’t want my fellow pozzies to be in the same situation that I was in — lost at the TB ward. LOL. I don’t where exactly is Quiricada street. Usually, I park at the DOH compound in front of the NEC building (LRT entrance) and then I just take a short walk to H4 or SACCL. Finally, I was able to wake up early this morning to go to San Lazaro for my post-laboratory test consultation and to get my CD4 count — my first official OPD day experience. I got at H4 pavillion at around 8am and to my surprise, I was almost the 20th patient in line. The nurse requested for my screen name and patient number for enlistment and then proceeded with the routine monitoring stuff — body weight, body temperature, blood pressure, and pulse rate. After which, I had nothing to do but wait until my name is called. Luckily, the head medical technician from SACCL was invited by the Head doctor to orient people on what CD4 and Viral load testing is all about and their cost implications. A little distraction from boredom. In the middle of her spiel, the nursing assistant called me in to the consultation room. I handed over my laboratory results to the doctor in charge. After quickly browsing through the figures, she smiled at me and told me that it’s nice that everything’s normal except for the UTI. She wrote me a prescription for ciprofloxacin for my medication and then told me to present her prescription to the nurse at the reception to get my free meds for five days. She handed me another prescription for urinalysis that I need to take once I have completed my medication and told me to drink plenty of fluids, in particular, water. After our short discussion, the doctor finally handed me the paper containing the result of my CD4 count taken two weeks ago. And to my surprise, it’s just a little below normal — 424. The normal CD4 count of HIV-negative people ranges between 500 and 1600. She told me not to be complacent of my health given that I know that my CD4 count is still high. It’s quite a relief. I left DOH smiling and promising to myself that I won’t risk my health anymore with the my unhealthy lifestyle. Which translates to no more smoking, drinking, stress and sleep deprivation. I need to maintain my CD4 count at that level.